Robatel is one of Europe's largest cask fabricators for radioactive materials, nuclear medicine, radioactive wastes, and fresh and spent nuclear fuel. Robatel is one of Europe's largest cask fabricators for radioactive materials, nuclear medicine, radioactive wastes, and fresh and spent nuclear fuel. We have designed and manufactured over 1000 Type A, Type B, and IP2 casks. 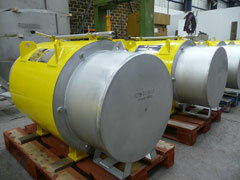 Our casks range from small nuclear medicine packages to large spent fuel transportation packages. As a result of our extensive cask development experience, Robatel has developed many proprietary fabrication processes, including specialized lead pouring and exclusive foam impact limiter designs. This continual development allows us to remain on the leading edge of the industry, developing products which are user-friendly, reliable, and simple to maintain. In addition to design and fabrication, Robatel has extensive experience with the regulatory approval process. 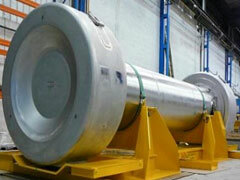 We have over 78 approvals of type B transportation casks, through both the IAEA and the US NRC. The typical approval process includes structural, thermal, containment, and shielding evaluations. We reinforce our analysis with various acceptance tests, including visual, weld, structural, thermal, shielding, pressure, and leakage testing. 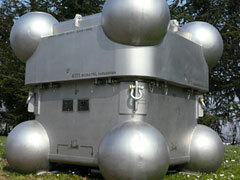 Robatel also maintains an in-house drop test facility, and has the ability to perform fire tests.